This year has started off unusually dry for Portland and Northwest Oregon. After a wet start to the rainy season in fall 2012, the proverbial spigot shut off at the turn of the New Year. We all know that “dry” is a relative term around here; it’s certainly been no Phoenix, Arizona. However, the rain we’ve had has generally been light and sporadic for the inland valleys. Ironically, seasonal snowpack around Mt. Hood and the Cascade Range to our east is still near-normal. 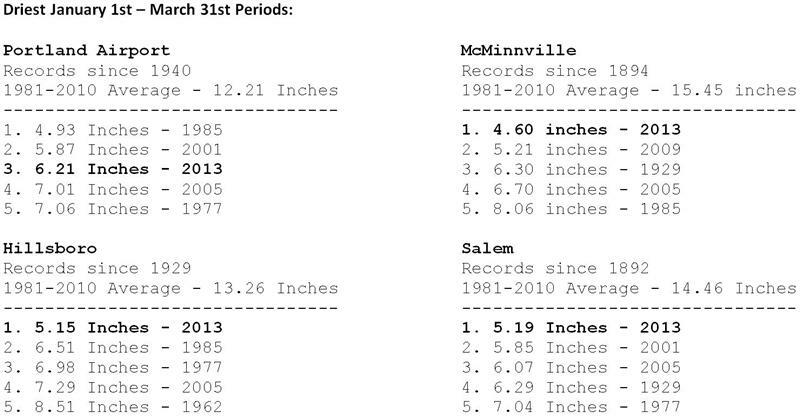 Below are some rankings for the driest January-March period on record at Portland Airport, Hillsboro, McMinnville and Salem. Precipitation was above-normal in November and December, so our “water year” (October – September) statistics aren’t as noteworthy, but they are definitely trending lower the past couple months. The outlook for the rest of spring and early summer is for an enhanced possibility of below-normal precipitation. This may be welcome for many farmers and growers who’ve dealt with very wet spring weather the past 3 years, but we need to keep an eye on our seasonal precipitation totals and consider how continued below-normal precipitation (if it happens) will impact soil moisture, reservoir storage, and summer streamflows. This information was provided to us by Shawn Weagle, Clinton Rockey, and Andy Bryant, National Weather Service – Portland, Oregon. Tree Give Away and Rain Garden Workshops!